Love-in-a-mist is a charming, old-fashioned annual flower. What is love-in-a-mist? 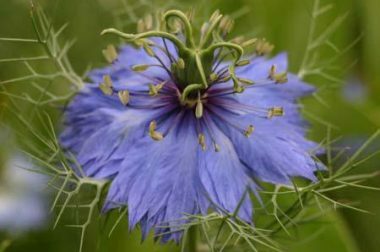 Love-in-a-mist (Nigella damascena) is a charming old-fashioned annual in the buttercup family (Ranunculaceae) that blooms in spring and early summer. 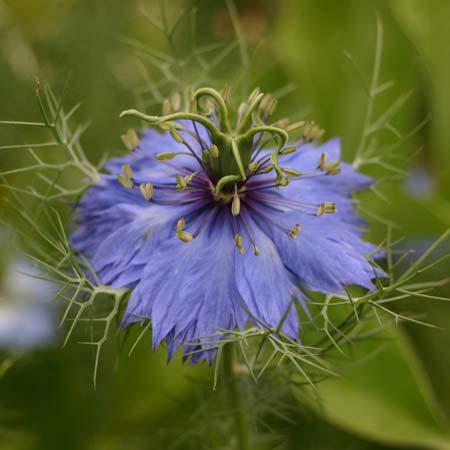 One of about 15 species in the genus Nigella, love-in-a-mist is native to southern Europe and northern Africa. In its native habitat, this plant grows in fields, along roadsides, and in rocky or waste ground. The genus name Nigella comes from the Latin “niger” (which means black), and refers to the plant’s intense black seeds. The aromatic seeds have been used for culinary and medicinal purposes (particularly in Turkey, the Middle East and India), although this species is inferior to black cumin (N. sativa), whose seeds develop a slightly bitter, oregano-like flavor and aroma when ground or chewed. Love-in-a-mist is a small to medium-sized plant that grows 15 to 24 inches high and up to one foot wide (if not crowded). Plants have finely cut, bright green leaves that resemble dill leaves. Light-green, lacy, finely divided threadlike bracts form the “mist” surrounding the plant’s jewel-like flowers. Love-in-a-mist flowers are typically bright blue to very pale blue, but sometimes may be white, pink, or lavender. Each flower is 1½ inches across, with five large, petal-like sepals and small, deeply-divided petals hidden beneath the flower’s stamens. The flowers are followed by attractive, balloon-shaped “seedpods” (actually an inflated capsule composed of five fused true seedpods). These “seedpods” are up to two inches long, and green with purple or bronze stripes. There are several named cultivars of love-in-a-mist. The cultivars have larger flowers than normal (often with double flowers having extra rows of sepals), and come in a wider range of colors than the species (which is typically blue). Look for common cultivars at your local garden center. •’Miss Jekyll’ is the most commonly offered cultivar and has soft blue, semi-double flowers. •’Miss Jekyll Alba’ has pure white semi-double flowers. •’Mulberry Rose’ has deep pink flowers. •’Oxford Blue’ is a taller variety with deep blue flowers and dark seed pods. •The Persian Jewels series includes plants with double flowers in a mixture of shades of mauve, lavender, purple, rose, light blue and white. Where do I get love-in-a-mist? Love-in-a-mist is easily grown from seed, which usually can be purchased wherever garden seeds are available. How do I grow love-in-a-mist? Love-in-a-mist does best in full sun and well-drained, fertile soil. Sow the deep-black, sharp-cornered seeds about ⅛ inch deep wherever you want the plants to grow. Seeds should germinate within two to three weeks under most conditions. Begin sowing seeds as soon as the soil can be worked in early spring. Thin emerging seedlings so that there are eight to 10 inches between plants. Seeds also can be started indoors four to six weeks before they are to be transplanted outdoors, but they should be sown in individual peat pots and transplanted with extreme care. Love-in-a-mist does not transplant well because of its long taproot. Once established, love-in-a-mist readily self-sows. Thin the seedlings while small to prevent overcrowding or encroachment on neighboring plants. Deadhead regularly or remove seedpods early to reduce the density of volunteer seedlings. Love-in-a-mist should begin to bloom about three months after seed germination and has a short bloom period (only a month or two). Make successive plantings every three weeks for continuous bloom all summer. Seeding in the summer or fall often will produce seedlings that will overwinter and bloom the following spring. Deadheading will prolong flowering, but will eliminate the plants’ decorative seedpods. How do I use love-in-a-mist most effectively in my garden? 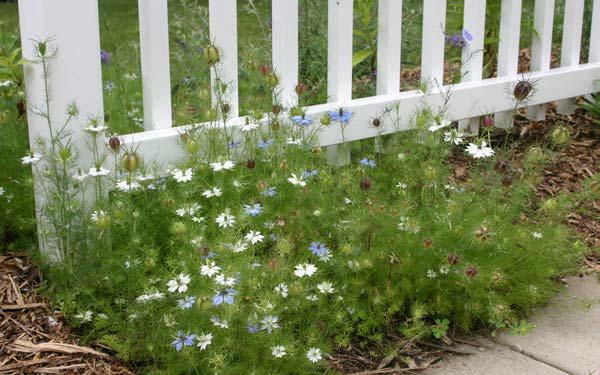 Love-in-a-mist works well mixed with other annuals in informal or cottage gardens. It is good for filling gaps in flower borders and for short-term massed beddings. Individual plants can be added to hanging baskets, window boxes or containers where the finely-cut foliage provides an interesting texture until the plants begin to bloom. 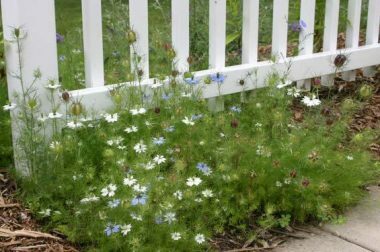 Love-in-a-mist can also be used as an edging plant, in a mass planting, or in combination with silver-leaved plants such as dusty miller (Senecio cineraria) or lamb’s ear (Stachys byzantina). You can extend the usefulness of love-in-a-mist and bring its beauty indoors by planting it with strawflowers (Helichrysum spp. ), bachelor buttons (Centaurea cyanus), bells-of-Ireland (Molucella laevis), globe amaranth (Gomphrena globosa – see University of Wisconsin Garden Facts XHT1171) or other flowers that dry well. Both the flowers and the decorative green and burgundy seed pods of love-in-a-mist can be used in fresh or dried floral arrangements. Cut flowers last longer if the leaves are removed from the lower part of the stem. To dry the seed pods, harvest when stripes are still visible and hang pods upside down in a dry, dark, airy place. Tie a paper bag around the pods to contain the seeds. Dividing the pods into small batches in separate bags will facilitate more rapid drying than placing them all in one large bag.